A snobbish investor and a wily street con artist find their positions reversed as part of a bet by two callous millionaires. Driected by John Landis, starring Eddie Murphy, Dan Aykroyd, Jamie Lee Curtis, Denholm Elliott, and Don Ameche and Ralph Bellamy. 88% on Rotten Tomatoes. Can You Stream It? As a note, for those of you familiar with this movie from the edited-for-cable version, it's an "Edgy, bawdy '80s comedy not meant for kids." Eddie Murphy's look when he breaks the fourth wall (when Randolph is over-explaining commodities) never fails to crack me up. As much as I loathe linking to Business Insider (the Huffington Post of business news), they did have an oral history about the making of the movie. Nothing from Ackroyd or Murphy, but Landis, Curtis and the writers are included. As much as I loathe linking to Business Insider (the Huffington Post of business news), they did have an oral history about the making of the movie. One of my all-time favorite movies, partly because it's a love-note to my hometown but mostly because it's just so damn funny. And I know it's pure coincidence but every time I see it I can't help but think of how much the fictional Duke brothers remind me of the real-world Koch brothers. And then I start wishing life would imitate art & give them their due. Happy thoughts! The scene where drunken Akroyd removes the salmon from his Santa costume and starts to eat it....both gross and hilarious. And don't forget a very young Al Franken appearing as a train porter. He was 32 and had three Emmys from SNL by then, just for the record. I recently made an attempt to watch Anchorman 2, having been told it's "actually" a clever parody of Fox News. I could only stomach about 20 minutes of it. It was, I thought, terrible and ill performed. I've always thought it was pretty difficult to make a good comedy film. So I asked myself, what if I re-watched an old comedy film that I enjoyed back in the day. 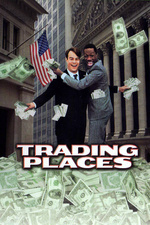 So I watched Trading Places just before Christmas. Except for a couple of cringe worthy bits (and they were very brief), this was hands down still enjoyable and far better than Anchorman 2. The key is in the writing and performances of course, which are sadly lacking in a lot of comedies. I've read that the likes of Anchorman 2 and Grown Ups 1 & 2, among others, are loosely written and then improvised, like Spinal Tap was. I guess they just can't improvise cleverly, should write more, and should tighten up their concepts if they are going to improvise. I loved Doctor Detroit as a teenager. I wonder how it would hold up. I remember it being a bit more on the "silly" side of comedy, which is also very difficult to do well. I loved Doctor Detroit as a teenager. I wonder how it would hold up. Funny that this is here - I actually just watched this last night! I've spent a while mulling over whether or not the movie is a critique of capitalism, or just a mockery of it while still upholding it.